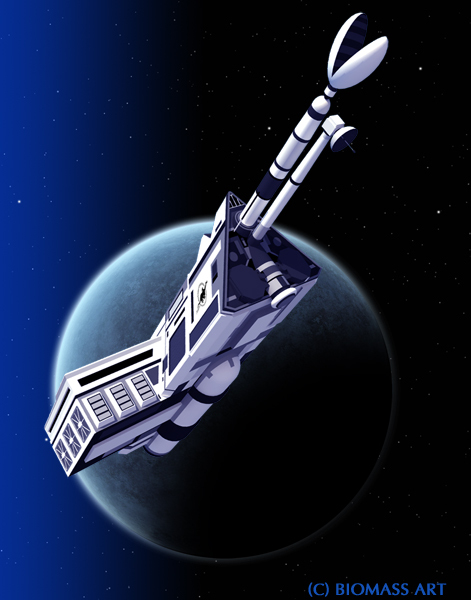 The survey scout is a typical ship in service with the Imperial Interstellar Scout Service. Its function is to continually re-survey the interior regions of the Imperium, updating maps and charts, and maintaining beacons and markers for astrogation hazards. The ship essentially serves much the same role as a modern day coast guard seagoing buoy tender, offshore supply vessel or ice breaker (or any combination thereof). The ship is catagorised as Type SZ, or “Scout Experimental”, and in fact three different versions of this ship have been built. The most recent, was the result of improvements to sensor placement made during the Second Survey and was producved in two variants. The Donosev Class Interstellar Survey Vessel was named after Master Chief Surveyor Villemina Donosev. Individual ships are named for famous scouts in the Imperial service. 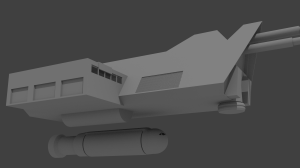 As is the case with most modern Scout vessels, the Donosev-class is not equipped for use in hostile areas. The survey scout is a peaceful vessel, typically unarmed and inoffensive. It does, however, mount four hardpoints and can be armed with a variety of turrets and weaponry if necessary. The Donosev class survey scout is named for famous scouts in the Imperial service. 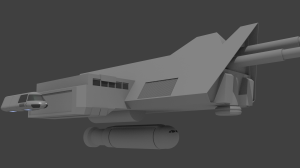 This is probably the one ship that is truly asymmetrical in shape among the Traveller starships and possibly because of this it was not very highly regarded amongs players I used to play Traveller with. However, I liked the old Donno because it is the perfect base ship for a medium crew. 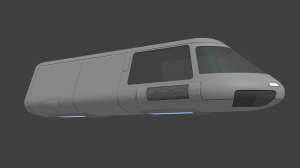 I plan to model two variants. One variant I call the ISV2 with three Hurricane Air/Rafts and the one variant I call ISV1 with a Kankurur Grav Carrier in a single larger Hangarbay in place of the Air/Rafts. Both vehicles are depicted in DGP’s 101 Vehicles, so I’ll go from there. 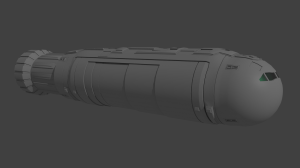 No idea how to fit that Kankurur into the hull though. Please note that the designations ISV1 and ISV2 that I use in this text are non-canon and used only to differentiate the two models. Both are Donosev Class vessels. I remeber to have read somewhere (DGP’s Grand Survey?) that the Hangar Bay of roughly a quarter of the Donosevs in service is about 2m higher and 1.5m wider but the remainder of vessel otherwise unchanged. That’s not easy to implement without outer changes on the craft, as you can’t simply go up or inward as there are are likely staterooms, corridors and laboratory spaces (as well as the brigde above the bay. Perhaps a bulge beneath the vehicle bay to allow for the extra height and width. The render above shows my approach with the bulge beneath the command section which was widened by pushing the outer wall another 1,5m into space. The resulting ship will be 135kl or aproximately 10dt larger in tonnage, which is or could be a problem. 410dt is well within the often cited 5% tollerance, which on the other hand was only meant to account for deckplan variance. Just from a modeling point of view one could assume the ISV1 being at about 405dt and the ISV2 at 395dt which would account for the ten tons difference and reduce the error to plus/minus 1.25% as compared to the calculated volume of 400dt. At least I am well prepared to accept that, until I have my copy of Traveller5 which I plan to use for calculating all my Traveller ships. The Tech level 15 Kankurur class Scout survey Grav Carrier was commissioned in 1097 – following a design dating back to 1095 – and is equipped to support both survey and exploration missions with full crews. . The Kankurur is a large pradtory bird native to Vland that was often trained as a courier animal capable of carrying up to 20kg of cargo in its talons. Consequently named vehicles often carry the names of significant native animals of the worlds of the Imperium. The vehicles’ sealed environment allows forl full pressurized life support for its crew. An airlock in the aft section opens to the roof as well as aft. A galley, four fold-up bunks, and a fresher allow extended missions. On the bridge, the basic controls are computer enhanced to increase the efficency and safety of operation. EMS active and passive sensors, a neutrino sensor, and a densitometer give a full range of information to the surveyers on board. A Meson communicator allows near-instant contact with any other station within planetary range. 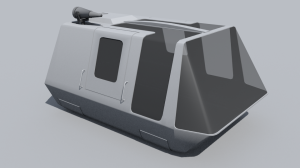 In addition to the crew (pilot and five operators or passengers) the grav carrier can carry 0.5 ton of cargo in the main cabin and 1.5 ton in the airlock. Unloaded, the craft weighs about 60 tons; with crew and maximum cargo it weighs about 95 tons. Top speed is at 240kph, cruise at 180kph and NOE at 190kph. The vehicle costs about 10.650.000 Cr amf displaces 11 tons. Length 15.25m, width: 8.30m, height: 7.50m. Jesse DeGraff did one that can be seen here, here and here. The Traveller game in all forms is owned by Far Future Enterprises. Copyright 1977 � 2012 Far Future Enterprises.